It’s a crisp fall day in Northville, Mich., a small suburb of Ann Arbor, and Kirk Maxey, a soft-spoken, graying baby boomer with a classic square jaw, is watching his 12-year-old son chase a soccer ball toward the goal. Maxey is doing what he does every Saturday, along with hundreds of other family men and women across the country, but he’s not your average soccer dad. Maxey, 51, happens to be one of the most prolific sperm donors in the country. Between 1980 and 1994, he donated at a Michigan clinic twice a week. He’s looked at the records of his donations, multiplied by the number of individual vials each donation produced, and estimated the success of each vial resulting in a pregnancy. By his own calculations, he concluded that he is the biological father of nearly 400 children, spread across the state and possibly the country. Maxey began donating before sperm banking became the big visible business it is today, where single women and couples can purchase STD-free, Ivy League, celebrity-look-alike sperm that has been quarantined and meets FDA mandates. But, in the ‘70s and ‘80s, the business operated behind a veil of secrecy. A man could clandestinely make some extra cash by donating to an infertile couple, and more often than not the ob-gyn, not the prospective families, would choose the sperm—his favorite tennis partner, perhaps, or in the case of Kirk Maxey, the handsome, blue-eyed, Nordic husband of his nurse. Now the confluence of genetic science and an increased awareness around the consequences of sperm donation is changing the game—and potentially the lives of Maxey’s offspring. Today sperm donation is no longer a shadow business, partially because infertility, single motherhood, and homosexual parenting have become more socially acceptable. (The California Cryobank alone now sells an average of 30,000 vials of sperm a year.) At the same time, donors and offspring have begun to connect though genetic testing and Web sites like the Donor Sibling Registry. In 2007 two of Maxey’s offspring, Ashley and Caitlyn Swetland, who are now 21 and 18, used the site to find Maxey, who had been a registered user since 2005. 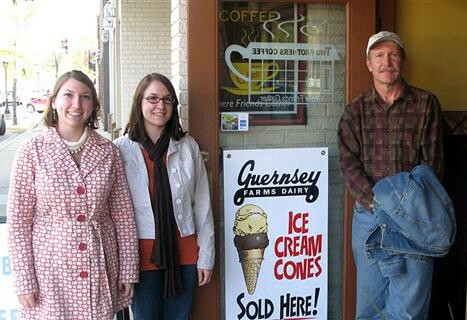 The sisters lived just 45 minutes away from Maxey, and soon began visiting a few times a year, going rock climbing with Maxey and his son or meeting up at an old-fashioned-style ice-cream parlor. No other children have come forward, but as Maxey’s relationship with Ashley and Caitlyn progressed, he began to think about the consequences of his earlier donations. These were questions that neither the sperm bank nor the government was asking. Several times Maxey tried to contact IVF Michigan, the bank where he made most of his donations, but it refused to release any information, noting that he signed a waiver to give up his rights to know who used his sperm. That’s still common practice among sperm banks unless a donor has agreed to be an “identity release” donor, which gives his offspring the right to get in touch when they turn 18. Even today, sperm banking is not strictly regulated. Currently, there are only recommended guidelines put in place by the American Society for Reproductive Medicine that say a donor should be required to provide a complete medical history to rule out “genetic abnormalities” or a family history of inherited disease and should receive proper counseling. The FDA has guidelines saying that a clinic cannot use a donor with a “relevant communicable disease agent or disease,” but does not require genetic testing. Most banks do not do genetic testing either. Despite these loose attempts at guidelines, sperm banking continues to raise a host of ethical, medical, and financial questions. There’s no social template for donors who are found by their offspring, or even rules about how many children should come from a single donor. Clinics are now struggling to answer some of these questions. In October, The Journal of the American Medical Associationreported that a 23-year-old donor used by a San Francisco sperm bank passed on a potentially deadly genetic heart condition to nine of his 24 offspring, including one who died of heart failure at the age of 2. The sperm bank now gives electrocardiograms to screen for genetic heart diseases among potential donors. Dr. Cappy Rothman, the medical director of the California Cryobank, says that his bank does extensive genetic screening. “We have a medical advisory board that constantly reviews our testing and adds any additional tests we feel will help protect our clients and their future children,” he says. Like most banks, however, it does not have a strict limit on the number of families per donor, though it says it tries to limit it to between 15 and 25. “Each sperm bank determines its own limits,” Rothman says. “CCB controls this number by limiting the number of vials we collect on each donor and actively soliciting clients for pregnancy reports.” The bank also does not offer psychological counseling to its donors, but he says it tells every donor that it’s important that they understand what they are doing—and the potential that they will be contacted by their offspring in the future. Last year Maxey read an article about Harvard’s Personal Genome Project, lead by George Church. Church began the project with the goal of building a public database of 100,000 people’s genomes in order to create a kind of Wikipedia of physical, behavioral, and medical genetic traits. The idea is that one day, if genome mapping becomes a standard practice, people will have access to better information about the relationship between genes and traits or genetic mutations and disease, and doctors may even be able to use the information to practice more accurate personalized medicine. Maxey contacted Church, relaying his concerns about the health of his potential offspring. As a result, Church chose Maxey as one of the first 10 volunteers to have his genome mapped and the results placed on the Internet. With just a blood and skin sample, scientists at the PGP project were able to isolate strands of Maxey’s DNA. These strands of DNA make proteins that drive the chemical reactions that make our bodies and brains run, and regulate the expression of our genes. Within these strands, there are unique sequences of A, C, T, and G molecules—the language of DNA—called nucleotides. Variations in these sequences called single nucleotide polymorphisms, or SNPs (pronounced “snips”), make individuals differ, and they serve as signposts for variants of a nearby gene on the DNA highway. Maxey worried that one of his SNPs would turn out to be a recessive mutation expressed as a disease such as Tay-Sachs or cystic fibrosis that would be passed along to his children. But where Maxey’s public genome can get really interesting is the way that his children may be able to figure out if indeed he is their biological father without ever seeing him face to face. This is possible through something in the genetic code called short tandem repeats. These are sequences of A, C, T, and G molecules that repeat themselves over and over along an individual strand of DNA and are specific to that individual’s DNA. Potential offspring could have some of their genetic markers run for a couple of hundred dollars by a company such as Family Tree DNA or Ancestry.com, and then take those markers and look at Maxey’s genome markers, which are now not only posted on the Personal Genome Project, but also on the Donor Sibling Registry. “If they see the same short tandem repeat number, then it’s very probable that I’m their dad because they would inherit the same pattern from me,” Maxey explains. The possibilities for genetic recognition have also pushed Maxey to start working with the Donor Sibling Registry to create a nonprofit database called the Cayman Biomedical Research Institute, in which he is collecting genetic information from donors and offspring who are interested in finding one another. This database goes beyond the work of the Donor Sibling Registry, through which donors and offspring are mostly matched through donor numbers and often poorly organized or incorrect medical profiles. People who pay $80 and send in saliva samples to CABRI can have certain genetic markers run in order that their short tandem repeats are matched, which will be the most accurate information about a biological connection. Since he began the project, Maxey has made hundreds of sibling matches and a half dozen parent-and-offspring matches. The nonprofit also advocates for more government regulation of sperm banks in terms of the kind of information that donors and families receive about births, background checks, and the degree of genetic testing.